The summer bounty begins. From Chappy to Chilmark, soil-streaked farm workers are harvesting bushels of fresh produce as the Vineyard nears the splendid season of ripe tomatoes and sweet corn. While tractors plow fields that emerged from the shadow of frost danger only a few weeks ago, just-picked vegetables, herbs and berries are hustled directly from Vineyard farms to seasonal and year-round customers that include some of the Island’s top restaurants. 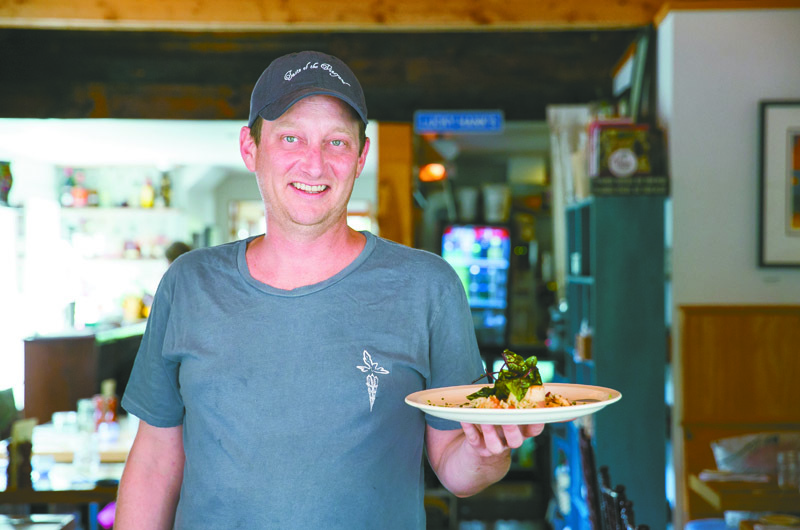 “We source as locally as we can, as much as we can,” said Kate Dougherty, general manager at the popular summer eatery Red Cat Kitchen on Kennebec avenue in Oak Bluffs, where chef Ben DeForest’s ever-evolving menu highlights what’s on offer from local producers. More than ever, Ms. Dougherty said, dining customers want to know about the food they’re eating, and a big part of the story involves the farmers who provide that food. To ensure that her staff is fully informed, Ms. Dougherty has organized field trips to local farms — including one that is in business 12 months of the year. Most of the Vineyard’s crop producers are traditional greenhouse-and-field operations, some run by generations of farm families, that go dormant for most of the winter months. But one of the newest is different in almost every way: Thimble Farm in Oak Bluffs, owned since 2011 by the donor-funded nonprofit Island Grown Initiative, raises food year-round without field hands, tractors—or even soil. Instead, fish lend a fin. Seven days a week, 52 weeks a year, the small staff at Thimble Farm — now doing business as Island Grown Farm Hub at Thimble Farm — tends more than 30,000 square feet of greenhouses filled with thousands of plants: herbs, greens, cucumbers, strawberries and more. Planted in gutter-like containers that are irrigated by a flow of water enriched with organic fertilizers, these crops root and thrive without dirt. Broad tanks of rainbow trout add further nutrients and yield a complementary harvest of fresh fish. “Local restaurants pick the fish up live,” said Keith Wilda, farm program leader for Island Grown Initiative and chief architect of the farm’s hydroponic/aquaponic agriculture program. Menemsha Fish Market, MV Smokehouse and the Ritz have all sourced trout from Farm Hub, Mr. Wilda said. A smaller-scale aquaponic — short for hydroponic (soilless) growing boosted by aquaculture (fish farming) — system was launched at the Martha’s Vineyard Regional High School last fall. What local chefs seem to find most appealing about the Farm Hub is not the live trout, or even the fragrant strawberries, but the fresh vegetables, herbs and specialty greens available through all four seasons, especially the red-veined sorrel and upland cress that Wilda has planted in response to their requests. “It’s fantastic to have local salad greens year-round,” said Douglas Smith, chef-owner at Lucky Hank’s on Upper Main street in Edgartown. 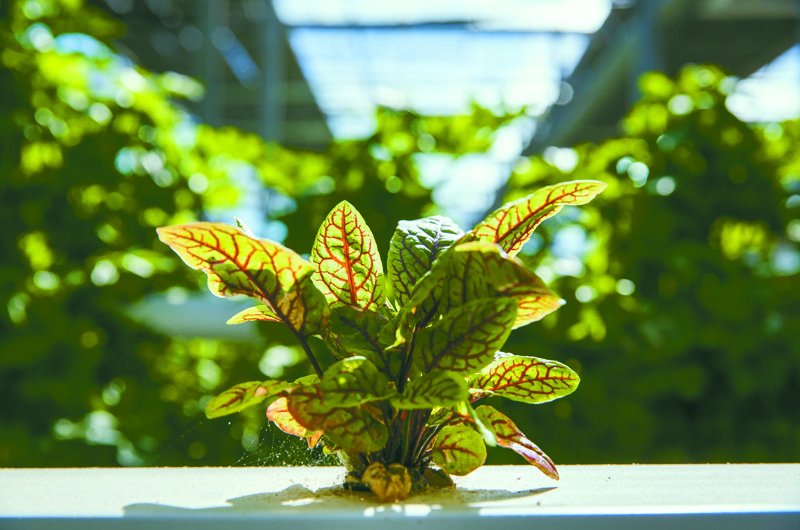 One of his current favorites is red-veined sorrel, a colorful cultivar of the traditional tangy-leafed spring green, that’s now available in all seasons from the Farm Hub along with other greenhouse produce. “It’s so green and fresh but has that beautiful citrusy flavor,” said Mr. Smith on a recent weekday afternoon, during his year-round restaurant’s customary break between breakfast/lunch and dinner service. “I cut it with the mixed greens they bring me, because it has flavor and color and I love it. 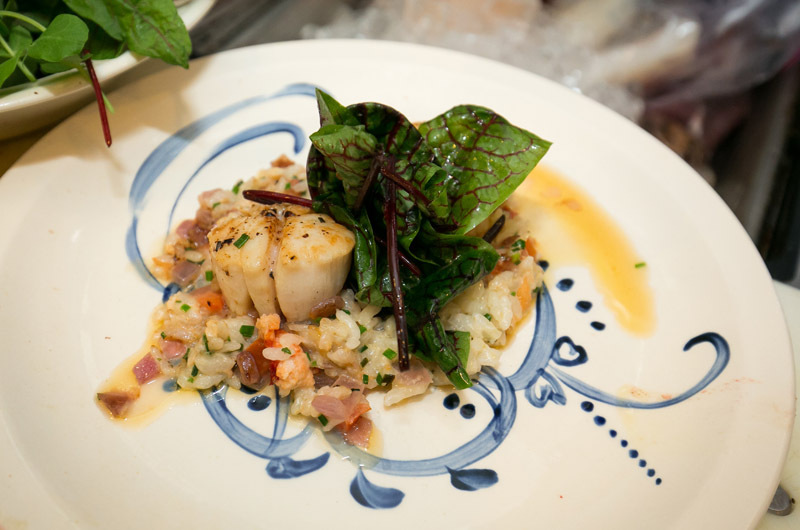 “I also am doing a dish with sea scallops over tomato-lobster risotto, and then I do a handful of the red-veined sorrel and pea tendrils mixed together with some fresh herbs — like chives, tarragon, parsley — a little bit of olive oil and a little bit of fresh lime juice, and I put it right on top so it’s like a cool salad on top of this warm dish,” he continued. Local chefs are also embracing Farm Hub’s upland cress, a biennial herb similar to watercress but with a bit more bite. Mr. Smith used the cress to showcase his tuna tartare with crostini at the recent Taste of the Vineyard culinary event benefiting the Martha’s Vineyard Preservation Trust. At Red Cat Kitchen, upland cress garnishes DeForest’s steak tartare. Farm Hub also sells its year-round produce to Cronig’s Markets, 7a Foods in West Tisbury and Park Corner Bistro in Oak Bluffs, while seasonal customers include Fella’s on Union in Vineyard Haven and the Boathouse Club in Edgartown. Both Mr. Wilda and Island Grown Initiative executive director Rebecca Haag said the Farm Hub’s mission supports local growers by increasing the demand for Vineyard produce. The Farm Hub can offer its produce at a reduced rate to local schools, the Martha’s Vineyard Hospital and the food bank, Ms. Haag added. These efforts would help to close the “produce gap” that exists between well-to-do Islanders and visitors—who can easily pay more than five dollars for a local heirloom tomato or a pint of strawberries—and those who are struggling to put food on their tables. The Committee on Hunger is already distributing fresh produce donated by local growers and collected through Island Grown’s gleaning program, which sends volunteers into local fields to harvest surpluses. Mrs. Burton said the committee wants to increase the amount to 70 per cent of the total food it distributes. “That’s what’s going to keep people healthy,” she said. Keeping people healthy is high on Farm Hub’s agenda too. The hub aims to support both local farmers and backyard growers with technical assistance. Mr. Wilda acts as the local agricultural extension agent — a job he did for years at UMass Amherst — and also organizes workshops and classes to educate local growers on cold frame techniques, hydroponic gardening and the like. Along with the Farm Hub and its gleaning program, Island Grown Initiative brings local foods to Vineyard schools, operates a mobile poultry-processing plant, leases land to other farmers and has recently planted a community orchard with dozens of different varieties of fruit, Mr. Wilda said. It’s all about making Martha’s Vineyard — from high-end chefs to the neediest residents — more self-reliant when it comes to what we eat. The Farm Hub offers greenhouse tours on Thursday afternoons. For more information, visit http://www.igimv.org/programs/island-grown-farm-hub. Islands seem to draw this activity. One of the largest schools teaching it is on St.Croix in the US VI. Hundreds have come there from around the world to learn Hydroponics and Aquaculturehub.org is the gateway to the worldwide network of practicioners. Hearing about this kind of initiative is encouraging, especially when the 99% are remembered. Crunchy, flavorful writing about an important topic. Thanks for the nutritious, delicious article!